Just a week after Beth Harrison’s visit, we were graced by another New York-based writer, Alissa Quart. Last month, Miami University Press published Quart’s first book of poetry, Monetized. In celebration of her book’s publication, Quart paid us a whirlwind visit here in Oxford. You’d never guess it, but Monetized is her first book of poetry. However, it’s only the most recent addition to her list of commendable accomplishments. Quart is an Emmy-nominated multimedia producer, the author of three non-fiction books, a co-editor of a journalism non-profit called Economic Hardship Reporting Project, and a revered journalist, professor, and poet. During her visit to campus, Quart agreed to attend an informal lunch with students. Because her work is so versatile, students from a variety of majors showed up to meet her and chat over Chinese take out. The students took advantage of the opportunity to pick her brain, and got a free lesson on how to write a hard-hitting piece of journalism. When asked how she manages to juggle so many projects at once, Quart said the key to staying motivated is having a lot to say. She feels an obligation to give voices to those who might not otherwise be heard, and that’s what keeps her chugging along. Although her work as a poet is secondary to her other professional undertakings at the moment, Quart was a poet first. She was a bit of a poetry whiz as a kid, and she won poetry contests while in grade school. Poetry used to be her “thing.” But, being as multi-talented as she is, Quart was drawn to other artistic pursuits after entering college. Now, she says she writes poetry to help her make sense of her emotions. Much of her journalistic work focuses on topics like economic hardship, parenting, mental illness, and urban living. As you can imagine, there are ugly sides to all of these topics. Quart says that much of the poetry in Monetized evolved from notes that she’d scribble down while working on other projects. Poetry allows her to vent when she’s feeling the feels. Quart is a commanding public speaker, and she oozed confidence when reading from Monetized. The audience was mesmerized. 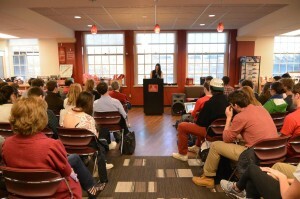 She read to a full house at the Miami University Bookstore. To say that Alissa Quart is busy would be a massive understatement. You’d have a hard time convincing us that she even has time to sleep. We were so pleased to have her here and grateful for the time she devoted to us. If you want to know what all the fuss is about, you can order a copy of Monetized by clicking here.